John was the second son of Roderick (1847-1910) and Jessie Margaret (1865-1959 nee Cameron) Finlayson. He was born at Redcliffs, Waiho Downs, near Waimate on March 20, 1889. John was educated at the Redcliffs School and had passed the fourth standard of education. On leaving school he mainly worked on his family’s farm in Middle Road, Ikawai, and other local farms. At the time of his enlistment on October 13, 1915, John was employed locally as a farming engine driver and gave his current address as Redcliffs, Glenavy. Being single he nominated his mother Mrs Jessie Finlayson of Redcliffs, Waimate, as his next of kin and was described as being aged 26, Presbyterian, 5 foot 7 inches tall, chest measuring 33-36 ½ inches, having blue eyes, a dark complexion, black hair, weighing 10 stone 4 pounds (66 kgs) and having his teeth being put into satisfactory order. 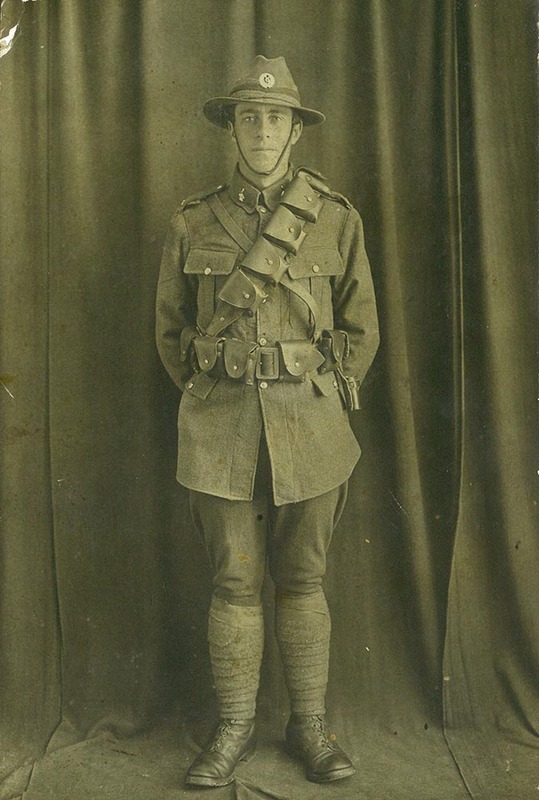 John had some previous military experience with the 8th South Canterbury Mounted Rifles and was posted to the Canterbury Mounted Rifles, C Squadron. At Featherston Camp he received seven weeks basic infantry training and another four weeks training with horses before he embarked at Wellington with the 9th Reinforcements on January 8, 1916, aboard HMNZT37 Maunganui. The Maunganui travelled in convoy with HMZNT 38 Tahiti and HMNZT 39 Warrimoo carrying a total of 2406 troops, arriving in Egypt on February 8, 1916. On March 11 at Moascar, John was transferred to the newly formed 2nd Battalion Canterbury Infantry Regiment which had been allotted a part of the Canal defences. On March 21 he was admitted sick to the Australian Casualty Clearance Station at Ferry Post, re-joining his unit at Moascar on April 2. Training continued until he was again admitted sick to the 2nd Australian Stationary Hospital at Tel el Kebir on May 10, transferred to the NZ General Hospital at Cairo on May 18, then to the Aotea Convalescent Home at Heliopolis on June 1, before discharge back to duty on June 26. On July 10, 1916, John embarked from Alexandria for Marseilles, France, and on July 20 was attached to the strength of the training battalion at Etaples. Here would have received a short period of intense trench warfare training before joining the 2nd Company of the 1st Battalion Canterbury Infantry Regiment on July 28 in the field at Armentieres. This was a so called quiet area to get the troops used to trench warfare. On September 15, 1916, they joined the Somme Campaign where they attacked the village of Flers, the first day that tanks were used in battle. During this period they fought 23 days without a break and advanced about two miles, before leaving the area in October back to the Armentieres zone. Here they did front line duties and made preparations for the battle for Messines (June 1917), but from March 11 to 25, 1917, John was admitted sick to 3 NZ Field Ambulance. In July his unit was in the vicinity of Ploegstreert, eight miles south of Ypres (which was known to those who served there as Plugstreet). On July 21, 1917, he was wounded in action (mildly gassed) and admitted to 3 NZ Field Ambulance, transferred to No 2 Australian Casualty Clearance Station on August 1, admitted to No 22 General Hospital, Camiers, on August 3, and finally to No.51 General Hospital at Etaples on August 8. On September 13 he was attached to the Depot strength at Etaples before going on leave to England from October 15 to 31. On his return to France he re-joined his unit in the field, but was again admitted sick to 4 NZ Field Ambulance on 8 December 1917. Transferred to 63 Casualty Clearance Station on December 26, he once again re-joined his battalion on February 3, 1918. Between March and July 1918 the NZ Division was based in the Upper Ancre valley between Hebuterne/Puisieux-au-Mont and Englebeimer. From July 8 to 11 he had another short spell sick in hospital and on October 23, was promoted to Lance Corporal. Further promotion to Corporal followed a few days later on October 29. The battalion had had a busy time right up to the end of the fighting and were dead tired. The last battle they were involved in was the Battle of Sambre (November 1–11) when, on November 4, the NZ Rifle Brigade scaled the town ramparts at Le Quesnoy. On November 28, 1918, the long march began into Germany where, on December 20, 1918, the NZ Division began occupation duties in Cologne. Finally, on December 26, he was promoted to Sergeant before being detached back to England to duty at Sling Camp on January 6, 1919. On March 6 he moved back to Codford before boarding SS Corinthic on March 12at Tilbury Docks, London, headed for home, arriving in Lyttelton on April 22, 1919. John had served a total of 3 years and 221 days and was finally discharged from the army on May 21, 1919, having reached the end of his engagement. He was later awarded the British War Medal and Victory Medal for his wartime service. On his return to New Zealand, he returned to his home town of Waimate where he worked as a labourer in the Glenavy area. Before he retired to his family home at 23 Leonard St, Waimate, John had farmed at Ikawai. In his old age though John become quite house-bound, relying on his walking stick for what little mobility he had left. While living in Leonard Street, John was regularly visited by RSA representatives, including local World War Two veteran Eric Batchelor. John died at Waimate aged 85 years on December 16, 1974, and is buried in the Waimate Lawn Cemetery. A fellow soldier, Mr W White, recounted at John's funeral how he (John) had shot down a German spotter plane with a Lewis gun during 1918 when the were "pushing the Huns back". This was the only such incident of an aircraft being brought down by ground fire that Mr White was aware of. John’s brother 47321 Private Kenneth Finlayson was also called up for service and entered camp on February 20, 1917, but was medically unfit and released from service on May 30, 1917.